with a civil aircraft while performing inverted Immelmann. What is an Inverted Immelmann? 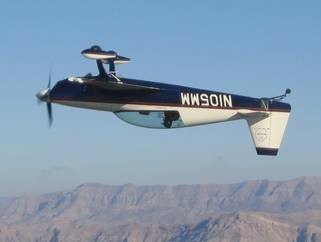 The Inverted Immelmann is an aerobatic maneuver in which I invert the airplane around its longitudinal axis (with the head down), then I execute the upward part of the looping turned back. When execute the figure, I create a very huge negative g force, I follow the crossing the vertical and the parameters, and then I smoothly pass to the horizon. Immelmann is used to quickly change the flight direction of the 1800 with simultaneous climbing a height. 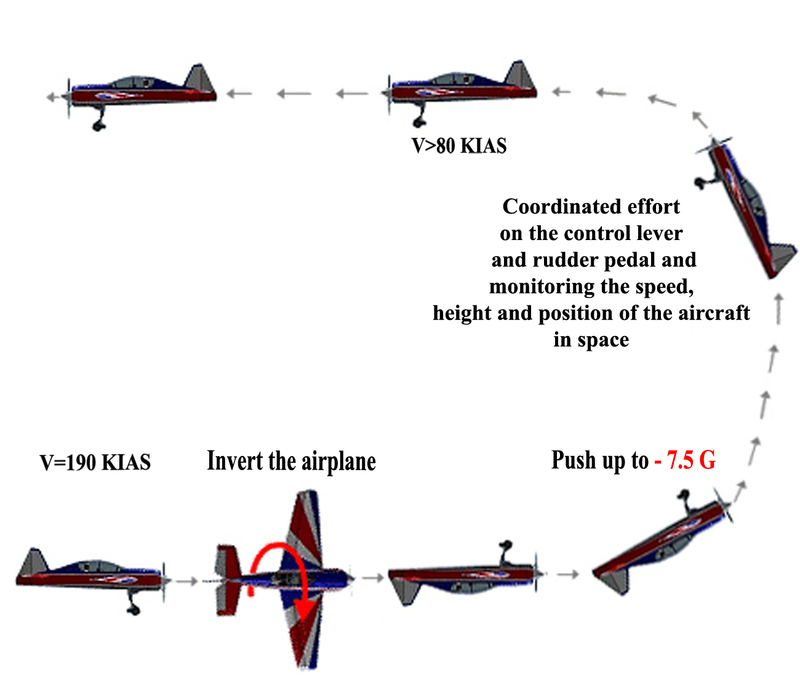 Immelmann’s performance is similar to the looping, but it is execute with a larger reserve of speed, with an estimate that the top speed will be 40-50 km / h greater than the stall speed. The reserve of speed is necessary to maintain sufficient maneuverability at the top of the immelmann. While performing the maneuver I invert the aircraft head down and start a coordinated effort on the control lever and rudder pedal control to prevent a drift of the aircraft. I am constantly monitoring the speed, height and position of the aircraft in space to estimate the effort rate on the aircraft’s control lever so that a curve is accurately outlined at the exact speed and height I need to finish the figure. This is important because in the air show I perform a lot of complex figures, and I have to finish each of them with the exact parameters needed to start the next one. 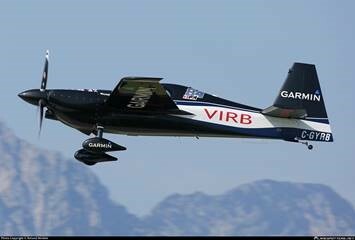 The G force I will experience during the performance of the figures is negative 7.5 G. For instance, the G force limitation of the MIG 29 or F 16 is negative 4 G and while training with a specialized civil aircraft is negative 5 G and above. If I fly these jet fighters with such G force, they will be destroyed in my hands. What kind of aircraft will I use? I will fly either EXTRA 300 or Zivko edge 540. 1 G is an acceleration of 9.8 meters per second per second (m / s ^ 2). To calculate the total G-Force of an object, you can simply “add” all of the acceleration vectors to find the net acceleration. An object on the ground (no air resistance) has a g-force of 1 gram. An object of the moon has a g-force of 0.181 grams. In a horizontal flight or in sloping downhill, Immelman’s speed is reached. Then smoothly but vigorously divert the lever backwards and bring the plane into the cab. Reaching the 250 ÷ 300 calibration angle, the deviation rate of the lever gradually increases with such an estimate that at the 400 ÷ 450 calibration angle the overload is 4-5 units. The deviation of the lever is then calculated in such a way that the flight speed on the speedometer is 30-40 km / h greater than the collapse at the top of Immelman. Upon reaching the upper point of Immelman, when the airplane’s nose is 100 ÷ 150 before the horizon, it is necessary to fix the position of the airplane and by diverting the lever and the pedal in the desired direction to begin rotating the airplane around the transverse axis in the desired direction. When the airplane is in the horizontal position, the rotation of the airplane must be stopped by coordinated movement of the lever and pedals in the opposite direction with subsequent return to neutral position.